The same day that I found the fairy ring, I also came across a caterpillar highway. At first, I only noticed one Wooly Bear crossing the path, and as I stooped to look at it, another caught my eye. I picked them both up and put them on my hand for a photo. Then when I leaned down to put them back on the ground, I found a third. Well, a photo of three in the hand is better than a photo of two in the hand, so I picked it up, too, and took another photo. Then I spotted a fourth caterpillar. And then a fifth. I wandered back and forth along about three meters/yards of trail and turned up these ten caterpillars all on or right beside the path. 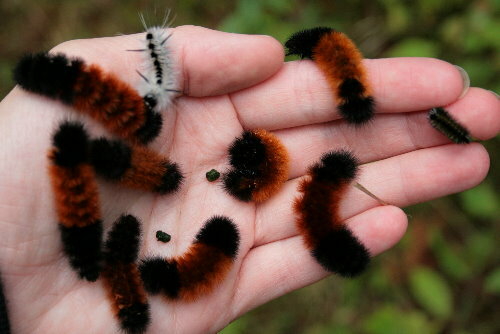 The brown-and-black ones are Wooly Bears, of course (my mom just did a great post about them). They were most likely wandering in search of a cozy place to hole up for the winter. The white one is a Hickory Tussock Moth caterpillar. I think the little yellowish-black one is a younger Hickory Tussock (many caterpillars change colour/pattern with each successive moult). The tussock moths are a group whose caterpillars all share the characterisitc of having these great tufts of “fur” poking out around their head and tail ends. If the hairs prick the skin they can cause discomfort and rashes, particularly in people with sensitive skin. This is also true of Wooly Bears and all other fuzzy caterpillars. Presumably the fuzz would act as a defense mechanism since if a predator eats one and ends up with an itchy/sore palate and tongue as a result, they’re unlikely to eat another. This may be why they curl into balls when disturbed, protecting their hairless belly (all of the individuals on my hand started out balled up, but as they realized I wasn’t going to eat them, they started wandering and didn’t re-curl even when I picked them up to adjust their position). Another reason for all the hair is that these caterpillars hibernate as caterpillars, not in cocoons, and the fuzz may act as insulation. It is also often used in the cocoon when they’re building it. Oh, and see those little green balls in the middle of all the critters? Caterpillar poop! On Saturday, as I was gathering up my gear to head over to the 100-acre woods, Dan called me over to the window well at the side of the house. Perched on the windowsill, looking not too happy about her confinement, was this giant toad. Between the muskrat and now the toad, I’m starting to think perhaps we should put some window screening over the wells. Or at the very least a board or stick so the animals can crawl out again. I scooped the toad out and placed her on our walk for photos, with a penny for scale. This was a particularly colourful individual, with pale yellow underparts and a beautiful reddish tinge to the brown sides. It was also a lot blotchier than the one I profiled last year. There seems to be considerable variation in the colour and patterning of American Toads, and I’ve been thrown off on occasion when the individual just looks so unusual to me that I think it must be a different species. 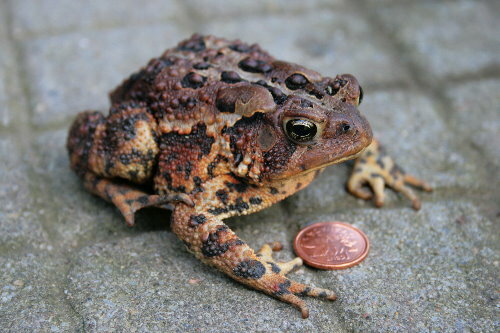 The only other species that might occur in Ontario to be confused with it, though, is Fowler’s Toad, and the latter always has three warts in the large black spots on its back, while Americans only have one or two. Dan had been on a roll. The day before, he found this owl pellet, which he carefully saved for me. It was underneath one of the big maple trees in our yard. Most likely it was the product of a Great Horned Owl that had stopped by one evening. So far, the Great Horn’ds are the only species of owl that I’ve heard around the new place. They’re generalists as far as breeding habitat goes, able to happily make a living in even smaller wooded areas. 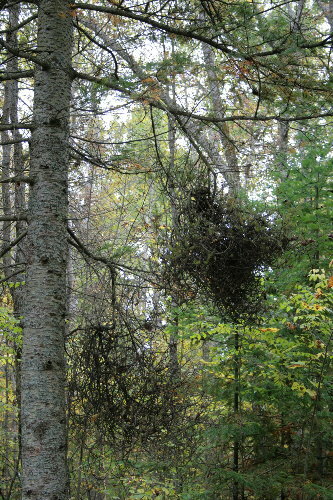 You’ll even sometimes find them nesting in urban woodlots or naturalized parks. At the lake house we had virtually no Great Horn’ds around, but did have several Barred Owls in the vicinity, which prefer larger tracts of mature forest. It was neat to think of the owl having been in our yard, and spent long enough in the tree to produce this. If it hadn’t left the pellet, we would never have known it had been there. Dan had saved the pellet thinking I might be interested in dissecting it and looking at the bones inside. Probably ordinarily I would have, but I happened to be distracted by this beetle. I found the beetle not far from the pellet, but placed it on the pellet myself. I know, I know, that’s cheating. Oh well. Makes a good shot, doesn’t it? The beetle actually stayed there where I’d put it, so I don’t know if it was interested in the regurgitated material, or was simply waiting for me to leave. 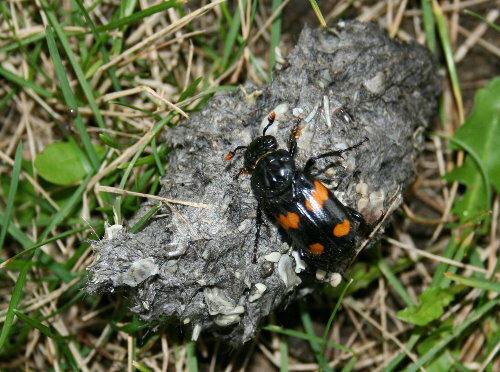 The beetle is a carrion beetle, perhaps Nicrophorus orbicollis, one of many species that can detect rotting carcasses from long distances, up to 1.5 miles (4 km) away. Perhaps even more remarkable, the beetles can detect the dead animals often within an hour of death. And probably even more amazing, these beetles exhibit parental care, the parents staying with the eggs, and then the young once they’ve hatched, and feeding them regurgitated food. 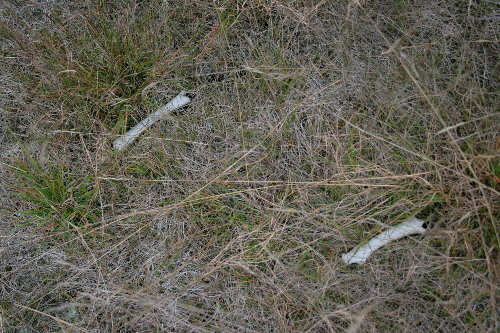 Speaking of bones, I encountered these buried in the grass at the back of the property last week. They’re obviously quite old and weathered, and have been there a long time. It’s most likely that they’re deer bones, perhaps a kill made by coyotes many winters ago, but not being an expert in bone identification I couldn’t say for sure. I found one or two more a short distance away. Given that there’s only a few bones and not a whole skeleton, I wonder if the animal had removed a leg or section of the prey and brought it here to consume in peace. A number of weeks ago I posted about a strange growth I found sitting on the trunk of a toppled hemlock in the 100-acre woods. At the time I thought it was an epiphyte, like a bromeliad, only some temperate woody species. I was corrected by a couple of my fabulous readers who pointed out that it was actually a deformity of the tree caused by a fungal infection, and was usually called a witch’s broom. While out this weekend I came across another one sporting these growths. However, these ones looked more like deformities than a separate plant perched atop a fallen trunk. I might have been able to figure out what they were if I’d seen these ones first. 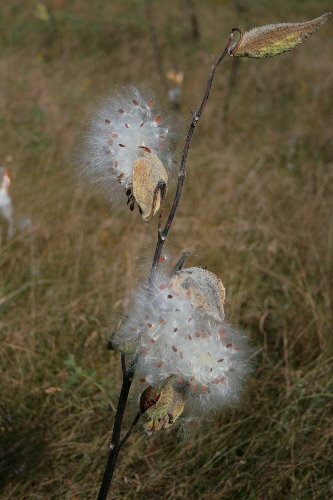 All the milkweed pods are starting to split open and release their seeds to the wind. 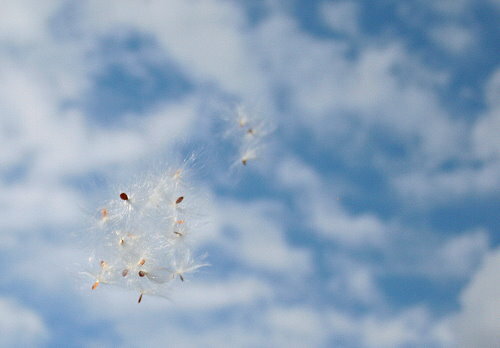 The meadows are dotted with fluffy white puffs, both attached to the plant still and ones that have already drifted off. I haven’t decided what message I should send off to Santa yet, though. In addition to the macaw clay lick, one of the stops on the Manu tour is near a mammalian clay lick, also called a colpa, that is often frequented by tapirs. 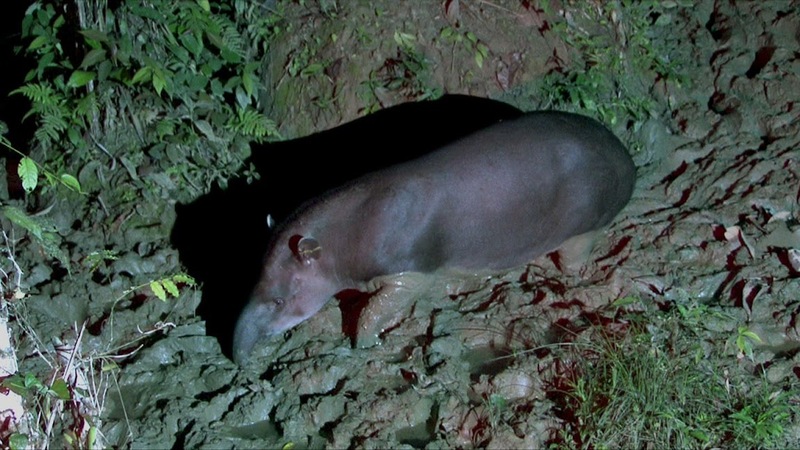 These colpas are understandably less busy than those of the avian sort, but are often the best chance one has of seeing tapirs and many other mammals in their natural habitat, since mammals, even the large ones, can be incredibly secretive. Many tour companies and lodges will take their visitors to a hide at dusk, and the tapirs visit in the early hours of the night. Like the parrots, the mammals are looking for minerals and salts to help with their digestion and boost blood electrolytes. It was nice of you to send the toad on its way with money for Tim’s. It seemed the least I could do after inconveniencing it so. I came across a woolly bear highway once years ago while driving around the backroads in south central NY. The road was full of caterpillars all wandering in the same direction. It was very odd! I just love that first photo! A handful of critters. It’s that time of year, though. Hard to find places where multitudes of caterpillars aren’t scampering about filling up before winter. I’m in agreement on the window wells. Seems they’re good traps, but that’s not really what you want them to be. But at least you had a chance to see one fine looking toad. Those caterpillars are just grogeous. They look more like plush toys than insects. Love those caterpillars! I had no idea that caterpillar highways existed – I’ll have to look more closely!